To evaluate the imaging of the natural history of Achilles tendinopathy microvascularisation in comparison with symptoms, using a validated disease-specific questionnaire [the Victorian Institute of Sport Assessment–Achilles (VISA-A)]. 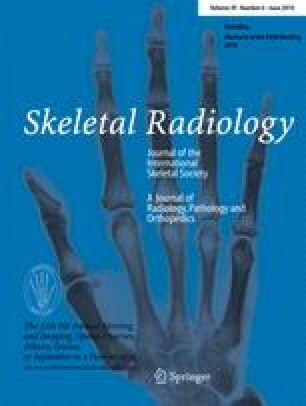 A longitudinal prospective pilot study of nine patients with post-contrast magnetic resonance imaging (MRI), time–intensity curve (TIC) enhancement, ultrasound (US) and power Doppler (PD) evaluation of tendinopathy of the mid-Achilles tendon undergoing conservative management (eccentric exercise) over 1 year. There were five men and four women [mean age 47 (range 30–62) years]. Six asymptomatic tendons with normal US and MRI appearance showed less enhancement than the tibial metaphysis did and showed a flat, constant, but very low rate of enhancement in the bone and Achilles tendon (9–73 arbitrary TIC units). These normal Achilles tendons on imaging showed a constant size throughout the year (mean 4.9 mm). At baseline the TIC enhancement in those with tendinopathy ranged from 90 arbitrary units to 509 arbitrary units. Over time, 11 abnormal Achilles tendons, whose symptoms settled, were associated with a reduction in MRI enhancement mirrored by a reduction in the number of vessels on power Doppler (8.0 to 2.7), with an improvement in morphology and a reduction in tendon size (mean 15–10.6 mm). One tendon did not change its abnormal imaging features, despite improving symptoms. Two patients developed contralateral symptoms and tendinopathy, and one had more abnormal vascularity on power Doppler and higher MRI TIC peaks in the asymptomatic side. In patient with conservatively managed tendinopathy of the mid-Achilles tendon over 1 year there was a reduction of MRI enhancement and number of vessels on power Doppler, followed by morphological improvements and a reduction in size. Vessels per se related to the abnormal morphology and size of the tendon rather than symptoms. Symptoms improve before the Achilles size reduces and the restoration of normal imaging over time. We thank Shearing Healthcare for the donation of some gadolinium. Shearing Healthcare had no direct input to, control of, or influence on, the study, design or results. We thank Dr. Richard’s long-suffering secretary, Cynthia Jackson, for preparing this document.